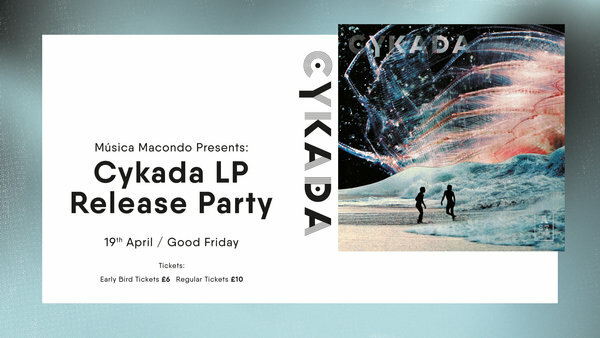 We are very excited to welcome Cykada to The Jago (formerly Passing Clouds) for an intimate release party, launching their debut LP which is out on the ever brilliant Astigmatic Records. This album is seriously special. In the last few years London has become the centre of the Jazz Renaissance. A new burst of energy and attitude brought by young musicians, equally inspired by the likes of John Coltrane, Pharaoh Sanders and Sun Ra, as well as J Dilla, Flying Lotus and Floating Points, has welcomed a freshness to the London Scene. This exciting new environment brought a group of young musicians together, all with a mutual desire to discover a new form of expression. Together they created Cykada. Cykada is a band of established musicians on the London scene, having played in groups including, Myriad Forest, EZRA Collective, Maisha, Where Pathways Meet, Family Atlantica and Don Kipper. Bassist Jamie Benzies is the spine of the project, along with Tilé Gichigi-Lipere also a former member of the legendary band Myriad Forest and Drummer Tim Doyle aka Chiminyo, together were the first members of Cykada. Trumpeter Axel Kaner-Lidstrom, Saxophonist James Mollison and secret weapon Guitarist Javi Pérez complete the ensemble. Tilé shows a unique and indispensable role within the band, aside from playing keys, he is programming, processing and modifying the sounds of the instruments, a massive factor in creating the distinctive vibe of the band. Cykada is an energetic bomb of unique style. It engages distant poles, analog worlds crashing with electronics, eastern influences crossing with western and harmonising nostalgic moments with dancefloor bangers. It seems that Western Africa borders with Eastern Europe, where Turkish music high fives Flamenco and all of this is wrapped up with the fundamentals of the London club scene. There are so many inspirations that it may seem impossible to unite them, however they make it happen, creating layers of devastation, beauty and intrigue. There will be Musica Macondo DJs warming up and down on the night to keep the vibes flowing. Tickets are very limited so grab yours asap.